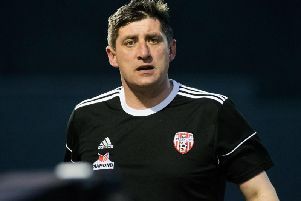 David Armstrong praised Dungannon’s response as they claimed a “massive win” against Crusaders. The champions lost at Stangmore Park for the third time in a row, falling 12 points behind leaders Linfield. After overcoming early pressure, the Swifts came good with Douglas Wilson heading the winner. Armstrong, part of a Dungannon defence that impressed on Saturday, said he felt they deserved the points. “It was a massive win and a good performance,” he said. “We probably started off a bit slowly and they had a few chances early on, but once we dug in and found our feet, we did well. “In the second half especially we played some good football. Dungannon have been in fine form but had lost to Coleraine on Tuesday night - their first defeat of the year. But they responded well on Saturday, despite missing a series of important players. Armstrong added: “We had been on a good run, and then Tuesday night was disappointing. “Going into the game today, we knew we needed to bounce back and get a result. Crusaders had started well with David Cushley hitting the bar - one of three good chances for the winger in the first half. But Dungannon stayed in the game and were a lot more disciplined after the break. They grabbed the win in the 59th minute when Wilson rose to head home a corner from Jarlath O’Rourke. Armstrong added: “In the first 15 minutes they were very good and we were a bit sloppy. We couldn’t keep the ball. “But once we weathered the storm we frustrated them and our shape was pretty good. Dungannon are back in action tonight when they play their rearranged sixth-round Irish Cup tie at Glenavon. They then face Warrenpoint Town in the league on Friday night, completing a busy 11 days. Crusaders, meanwhile, must put this defeat to one side. They had lost here on their last two visits - in the league in September, and last season’s League Cup semi-final, and this was another frustrating result for boss Stephen Baxter. Next up for them is a home game against Coleraine on Friday, and Baxter wants to get back on track quickly. “You want to win every football match you play - you don’t turn up not to win, so we have to reinvigorate ourselves and push hard,” he said. Baxter admitted he was frustrated with this result. “I’m not disappointed with the performance - it was excellent today - we just didn’t get the breaks,” he added.